The purpose of this document is to explain the procedures of the MONARC method by describing the various steps offered by the tool. 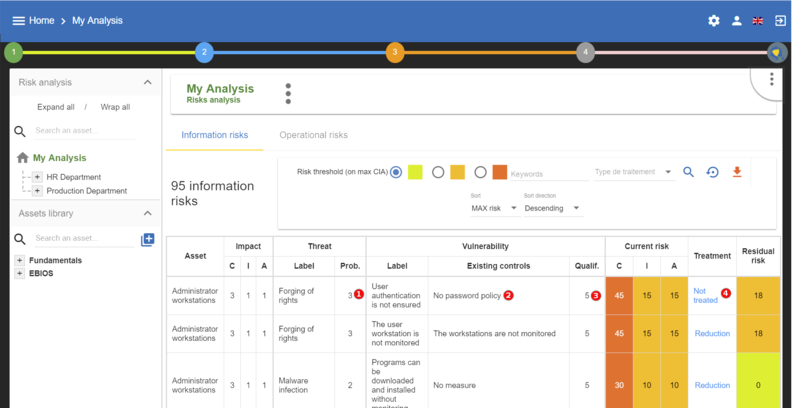 MONARC is an iterative and qualitative method of risk analysis in four stages; broadly inspired by ISO/IEC 27005. 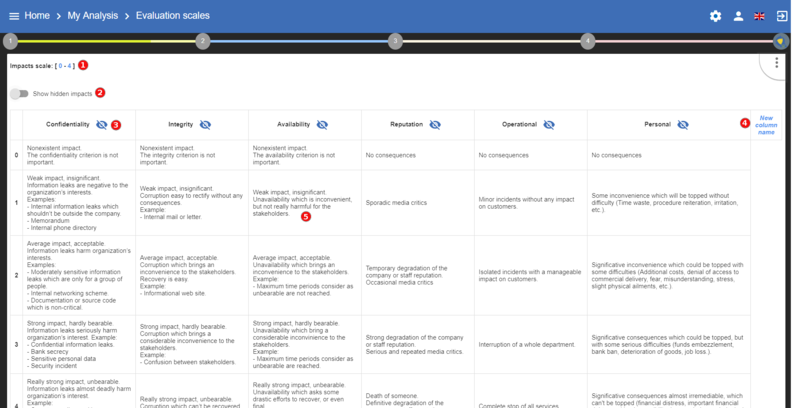 MONARC uses an iterative method which enables the pragmatic progression of risk management. This approach, as recommended by ISO 27005, enables the user to restrict himself to the essentials, then to carry out successive iterations to broaden the target or further refine it to cover more technical aspects. The optimised risk models provided as standard with the tool will enable this type of management to be carried out. 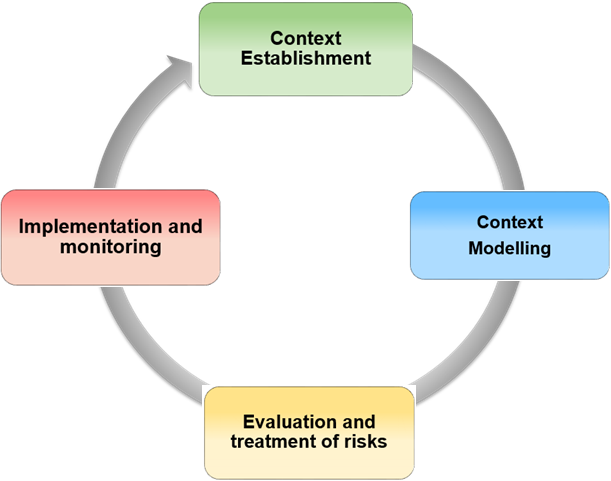 Context establishment: Definition of the target of the risk analysis, establishing and describing the context, defining the risk analysis criteria and the structure of the risk approach. 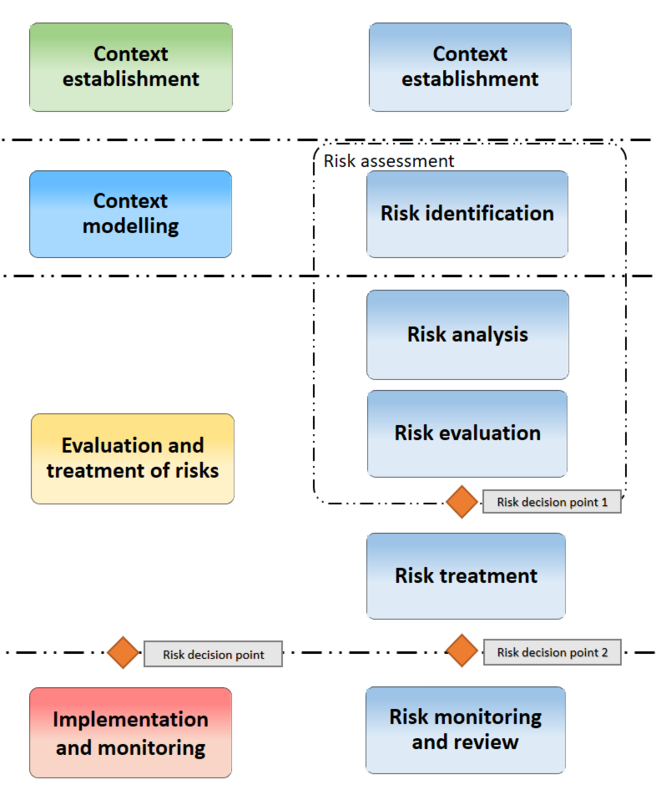 Context modelling: Development phase of the risk model. After having identified the primary assets, they just need to be broken down into support assets on a priority basis. 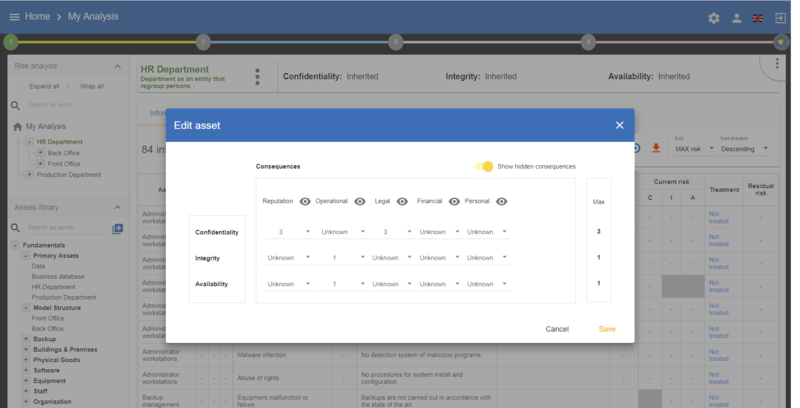 The most common assets are present in the MONARC knowledge base and therefore identification of risk by default is offered. This type of identification may be sufficient in an initial risk iteration; however, it is the responsibility of the risk expert to provide the comprehensive model. 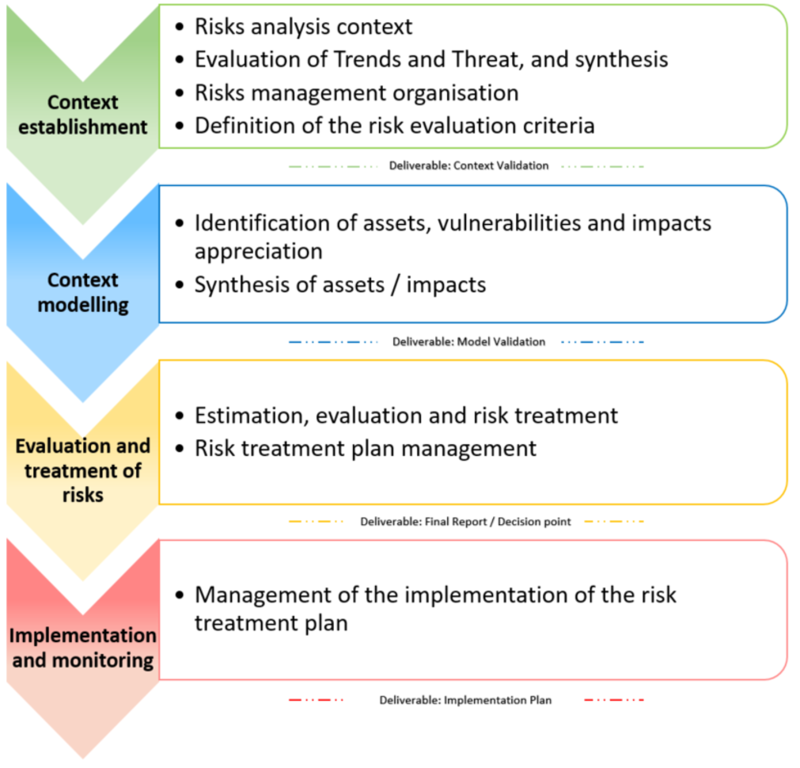 Evaluation and treatment of risks: Risk assessment involves establishing the level of threats and vulnerabilities of the context type under review. The processing of risk entails proposing security measures which tend to lower major risks to acceptable levels and to accept low risks. Implementation and monitoring: The current MONARC version provides a follow-ups views in terms of the implementation of recommendations. 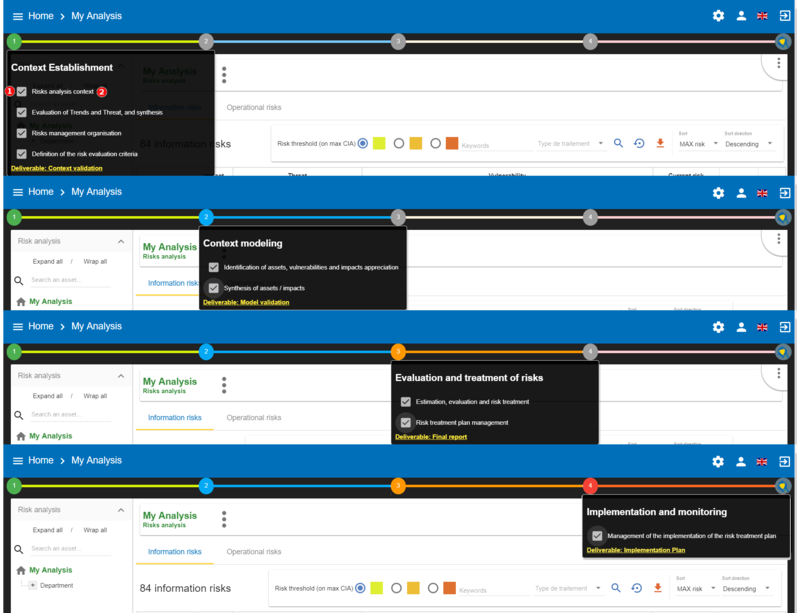 Monitoring involves checking the major changes to the risk analysis context on a regular basis, as well as any major changes beyond said context which would imply a redesign of an analysis iteration. the risk parameters are determined on a contextual digital scale which enables the risks to be prioritised. This approach is based on ISO/IEC 27005 as it is easier to understand, especially for non-tangible criteria in terms of impact and consequences, such as reputation, operational, legal, etc. The illustration above displays the similarities between ISO/IEC 27005 and MONARC. Access to the views of the various stages of the method is provided by clicking on the numbers 1 to 4, which are displayed under the Breadcrumbs in the main MONARC view. The ISO/IEC 27005 processes are implemented via the views. 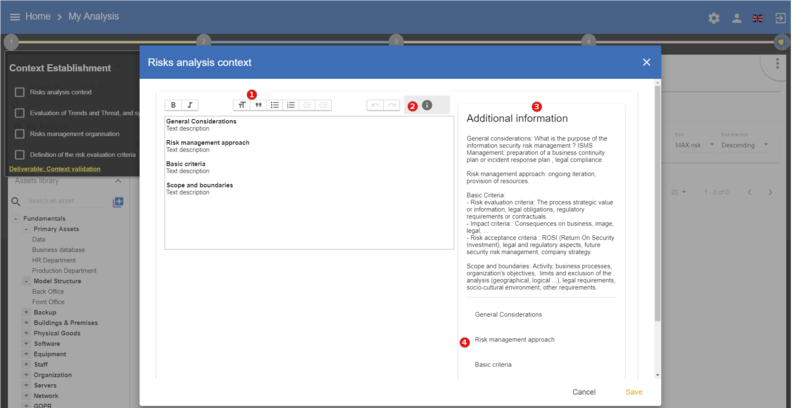 Link to the contextual management pop-ups, see the following chapters. Boxes to tick, indicating that the stage selected has closed. 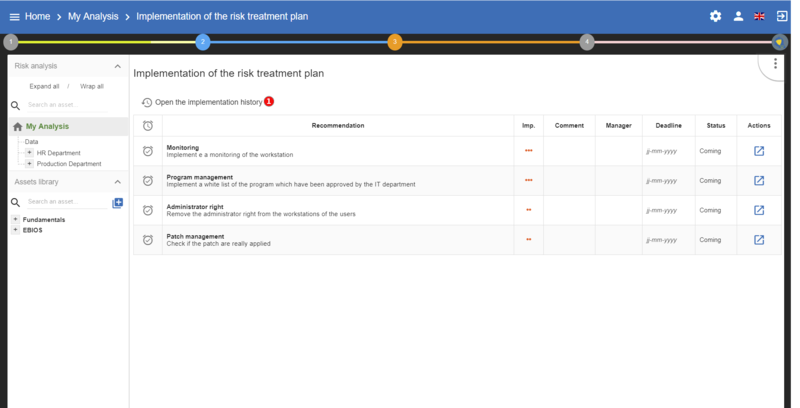 This optional information helps to show the progress of the risk analysis project and display the risk representation graph of the dashboard. 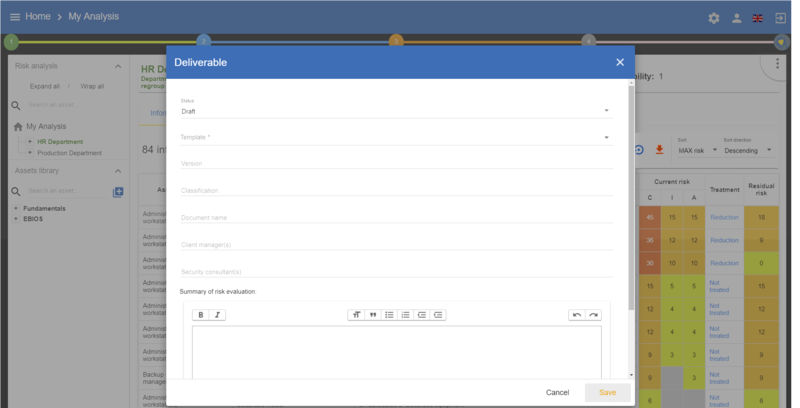 Link enabling the Validation of the context deliverable to be generated. As part of a consultancy assignment, for instance, it may be helpful to get the client to validate it. 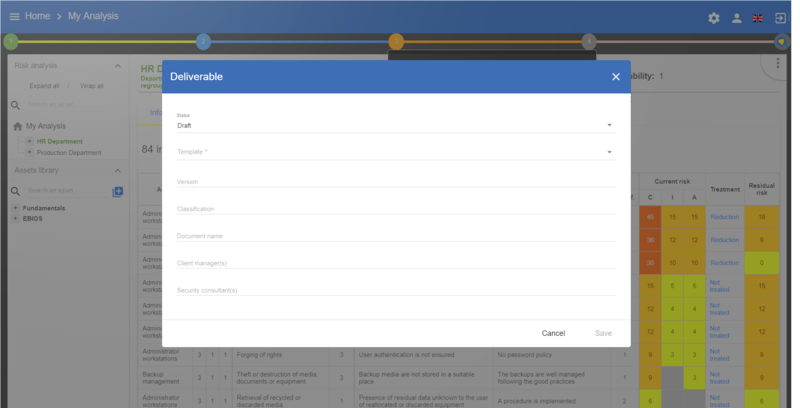 This view offers text encoding and formatting functions, enabling the risk analysis target to be contextualised with well-formatted texts that will be documented in the deliverables. Access to the text formatting functions (bold, italics, paragraph, text size, etc.). The quality of the encoding directly affects that of the deliverable. To display or delete the help area. Help area on the content which is recommended for data entry (Additional information). Chapters recommended by ISO27005. Clicking on the label will place it automatically in the data entry area. This stage is divided into three separate parts which structures the data collection necessary for understanding the context to analyse. It is advisable to chair a working party of 5 to 10 people (depending on the organisation), bringing together the members of management, IT, risk management department (if it exists), the heads of departments or key personnel. Trends Assessment: MONARC provides a series of questions to establish the context from a very general perspective (see Trends Assessment). 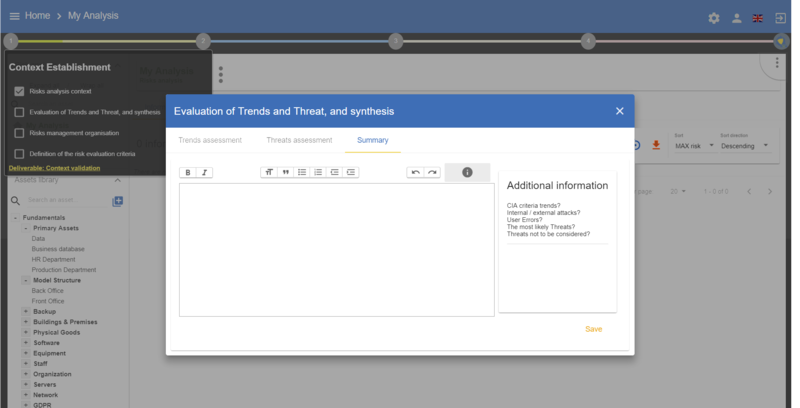 Threats Assessment: Enables the threats to be reviewed from a general viewpoint and, possibly, to evaluate by default in the future model (for more information, see Threats Assessment). Summary of key points determined during stages 1 and 2 (for more information, see Summary). The assessment of trends provides a series of questions to establish the context from a very general perspective. These questions highlight the selection of key assets which must be taken into account during the analysis, the security criteria, as well as a few indicators concerning the motives of the attack and the external context of the target. This list is not exhaustive; you can add questions of your choice at the end of the page. Relatively ++: Already occurred on one or two occasions The security expert is responsible for converting the consensus into a probability value of 1 to n which shall be used in the model. 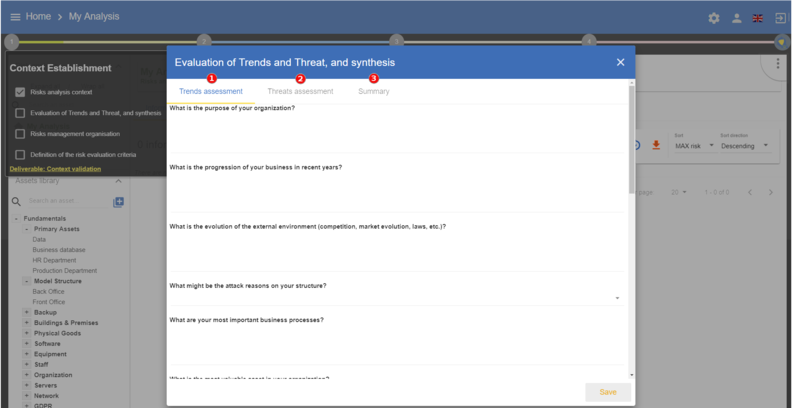 Click on the Threats assessment tab. Observation to encode, information gathering from a group of persons. Information on the security criteria affected by the threat. Choice of the trend, obtained by group consensus. Selection of the probability deduced from point 6 by the security expert. Possibility of subsequently running the threats of the model (after they have been developed). Save the information and browse the threats. 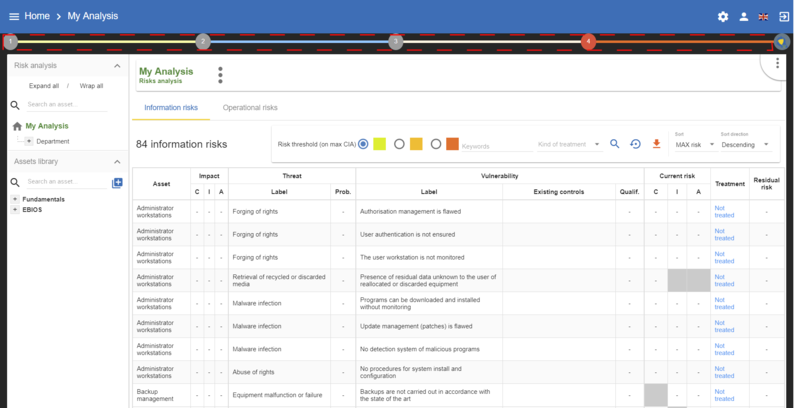 In similar fashion to the context of the risk analysis, this view enables the user to summarise the pertinent information gathered during the assessment of trends and threats. This text enables the user to enrich the deliverable. This view enables the user to encode the information on the context of the risk management, for instance, with regard to the roles and responsibilities, the stakeholders, etc. This involves personalising the scales and impact criteria and consequences. MONARC provides values by default which can be personalised depending on the context. All the scales can be modified and the levels personalised. However, it is no longer possible to modify the scales when an assessment has been encoded. Click to modify the number of scales. 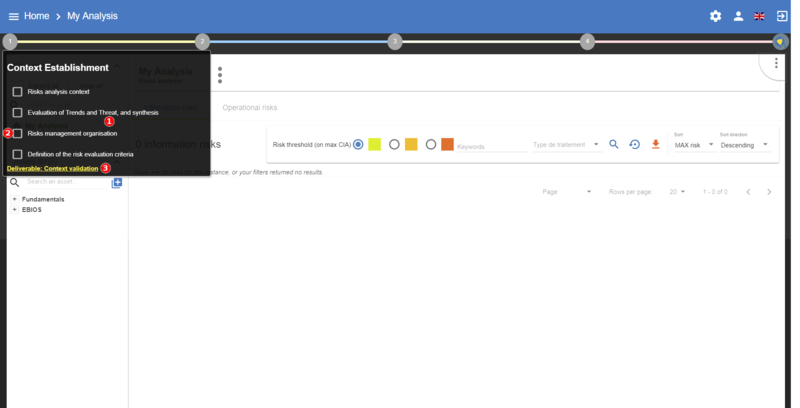 Click on Show hidden impacts to show or hide the criteria not used in the analysis. Click on the symbol to hide an unused column. Click on New column name to add a new impact criteria. Click to edit the headings of each scale. the management is similar to an Excel table, by clicking on a heading, it is possible to edit it; clicking on another, the first heading will save automatically and so forth. It is also possible to add personalised consequences as well as impact criteria. The information risks are evaluated on the CIA criteria by taking into account the ROLFP consequences. 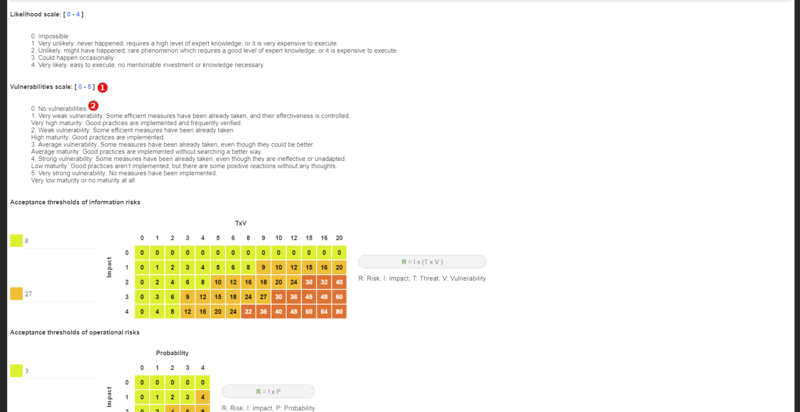 Click to edit the heading on each scale (Management identical to the impact scale). The scale of vulnerabilities is only used for calculating information risks. Modification of thresholds levels of informations risks. 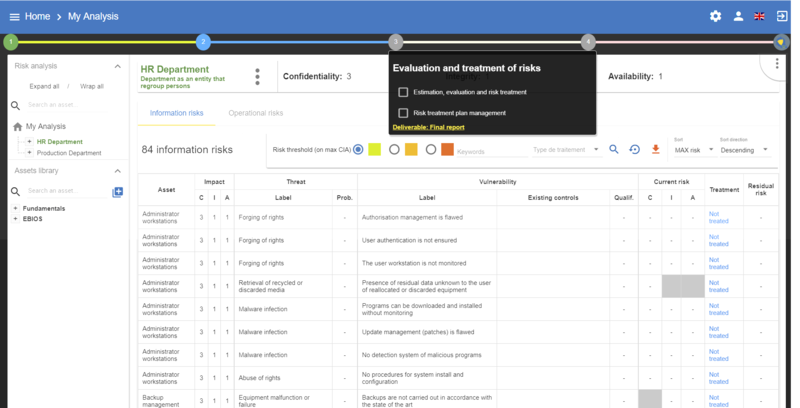 The table displayed above (as well as the risk analysis tables) is updated automatically. Modification of thresholds levels of operational risks. 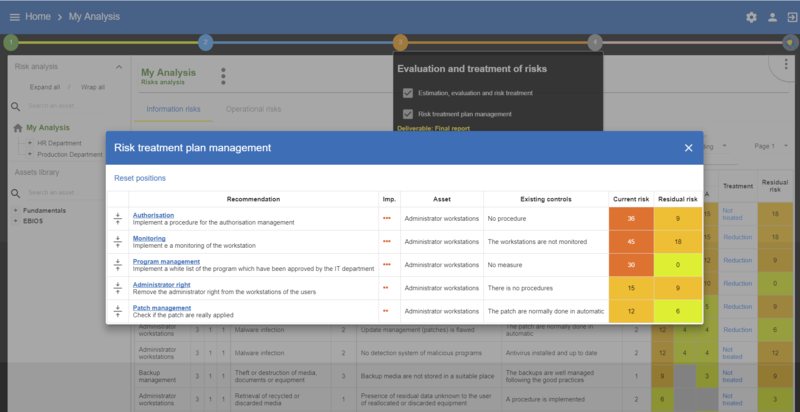 The table displayed above (as well as the risk analysis tables) is updated automatically. This deliverable includes all the information gathered and entered in the context establishment phase. It can be used to validate the information provided by the client, before beginning the risk identification. A form has to be filled in. When the user clicks on Save, a file in Word format is generated. 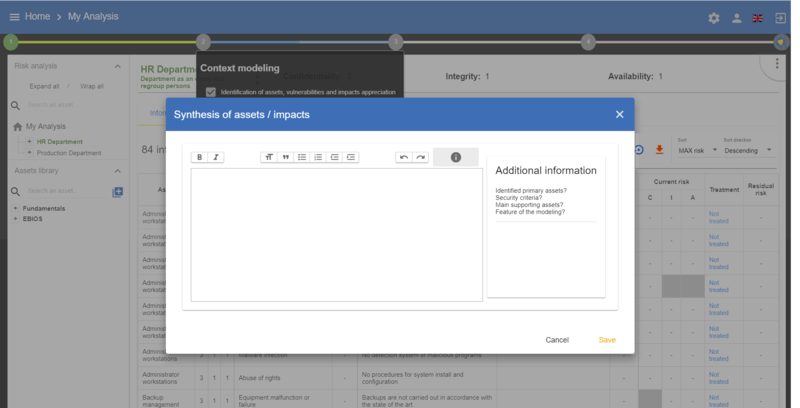 Clicking on the link Identification of assets, vulnerabilities and impacts appreciation will generate the main view of MONARC. 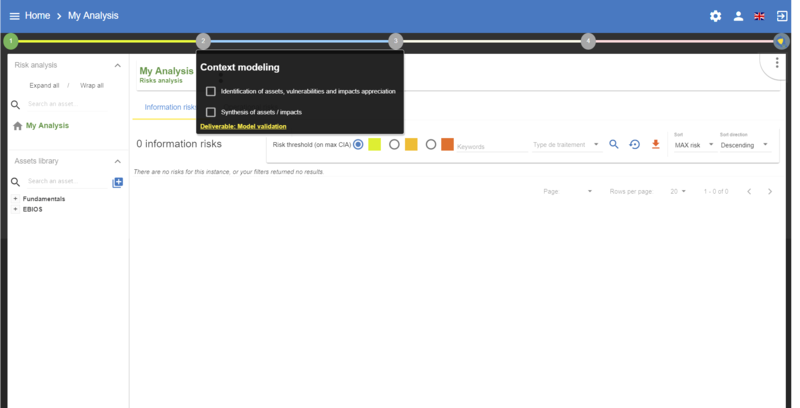 The purpose is to create the risk model by using the assets in the library. The principle of the modelling is to place at the root the analysis of the primary assets, then place the support assets which make up the parts above it. The context establishment phase is used for determining the primary assets which will be the subject of the analysis. At this stage of the analysis, certain secondary assets may already be known. By default, MONARC offers a Front Office and Back Office structure; however, this is not an obligation. It is vital that the construction of the model follows a contextual logic, the assets and terms listed must use the organisation’s terminology. To do this, the user must not hesitate to rename the assets provided by default by the library. The Front Office represents the “user” side; for example, in the case of a “Human Resources” department we will find employees and the complete IT system to which they have access (office, workstation, hardware, software, individuals, etc.). The Back Office represents the IT and organisational side of the organisation that are common to all concerned (building, data centre, network, administrators, common rules, etc.). For each primary asset, the impact and consequences which may apply must be defined, if the risks in the model arise. By default, all the supporting assets will inherit these impacts, but it is also possible to redefine them. When the primary asset is a service, then the C (Confidentiality) and the I (Integrity) refers to the most sensitive information of the service in question. A (Availability) refers to the service and the information, based on the principle that if the information is available, the service will also be available. When the primary asset is the information, there is no ambiguity regarding the CIA criteria - it refers to all the information. In certain rarer cases, if the C associated with a service conveys the confidentiality of the operating procedure (e.g. manufacturing process), the user just has to express the assets in the model separately in the form of an informational asset and a service. 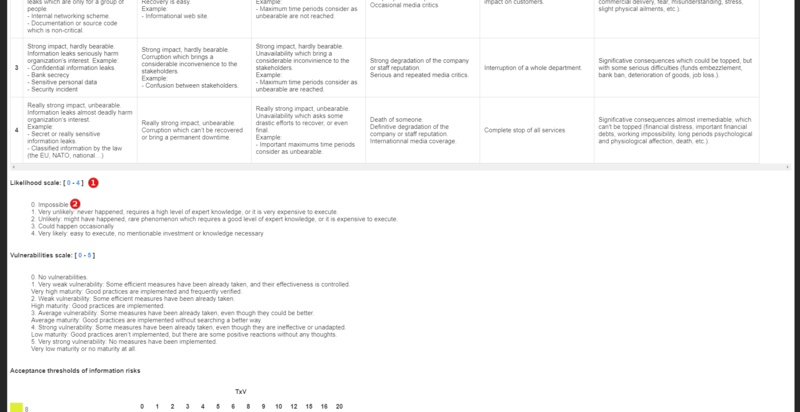 The value of the CIA criteria is deduced automatically according to the ROLFP consequences or other consequences which have been associated with them (maximum value). For example: In the case of the abovementioned example, the 3 impact level on confidentiality is explained by the maximum ROLFP value regarding the confidentiality, which in this case is 3 in terms of consequence for the person. The summary of the assets will provide editorial content that justifies the choice of assets and impact for the deliverable. This deliverable covers all the significant primary assets of the model. Those on which the impact is reported as well as the asset summary. A form has to be filled in. When the user clicks on Save, a file in Word format is generated. Clicking on the link Estimation, evaluation and risk treatment will generate the main view of MONARC. 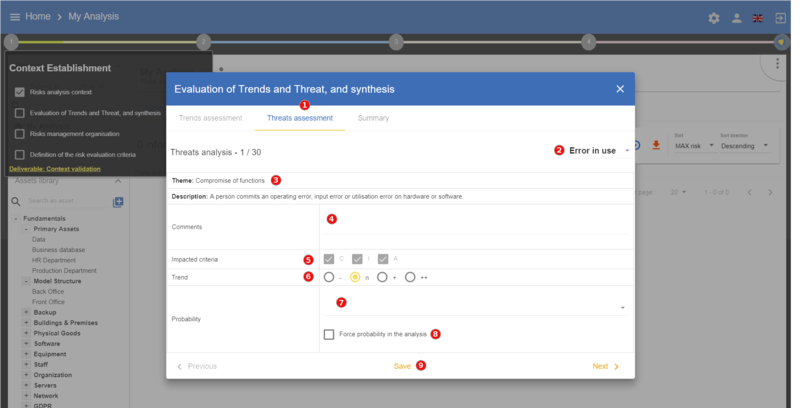 The previous phase provided the impact criteria information; now it is necessary to evaluate threats and vulnerabilities in order to calculate risk levels. If the threat assessment made while establishing context provided probabilities (see Threats Assessment), it is necessary to return to this screen to run all the threats of the model. Prob. : Then, when reviewing the model’s risks, the default values may all be revised individually. The level of vulnerabilities depends directly on the existing controls. It is necessary to describe all these measures in a factual manner. 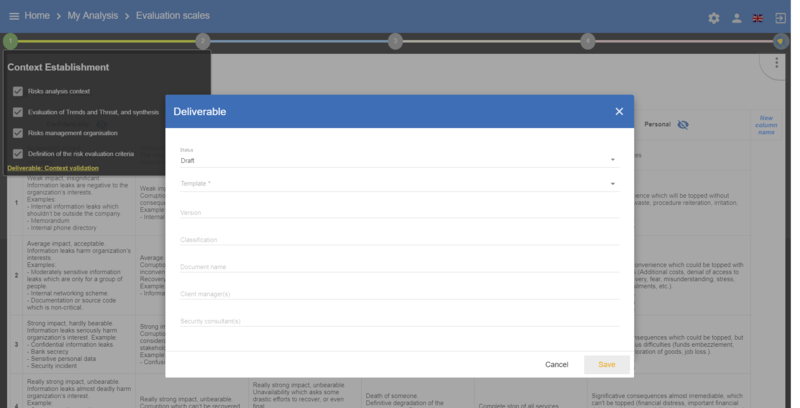 The qualification of the vulnerability can be set according to the existing controls. Accept: The risk is accepted in its current form. No additional action will be initiated. Modify/reduce: Measures are put in place to reduce the risk to an acceptable level. 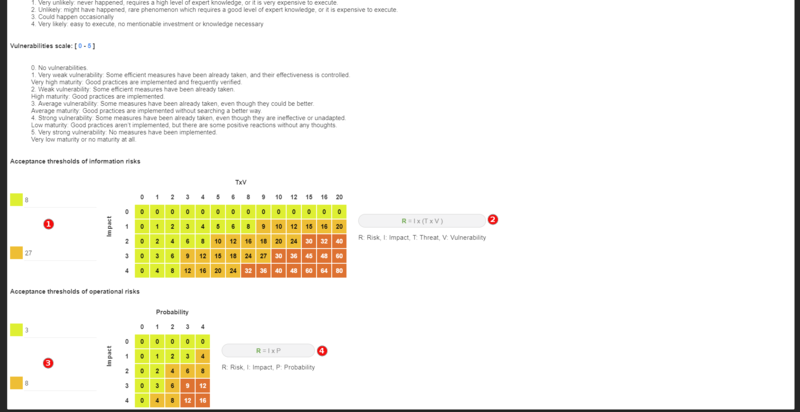 The reduction level is then evaluated in order to calculate the residual risk. Share: in the case of insurance, for example. This type of processing is specific, as it tends to reduce the risk impact and not the vulnerability. The residual risk cannot be calculated. Deny: The cause of the risk is eliminated; after processing, the risk must not longer be present. 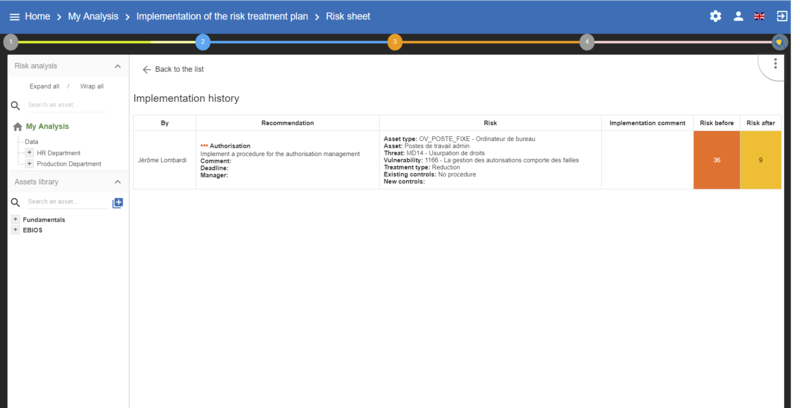 It is also possible to add a recommandation to implement see Risk information sheet in user guide. 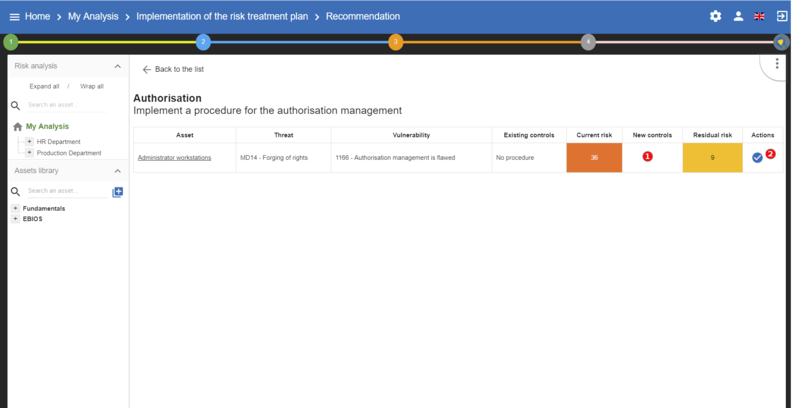 All risks covered by one of the four procedures described above are registered in the risk management plan, irrespective of whether they are information risks or operational risks. The calculation formula is not the same for both types of risk; therefore, it is the importance of the recommendations which establish the order of risk. Nevertheless, it is possible to reset the order of the risk processing plan before generating the final deliverable. The deliverable contains a complete list of all the information gathered and entered in MONARC, including that contained in the two previous deliverables. A form has to be filled in. Moreover, it is possible to add a summary of risk evaluation. When the user clicks on Save, a file in Word format is generated. 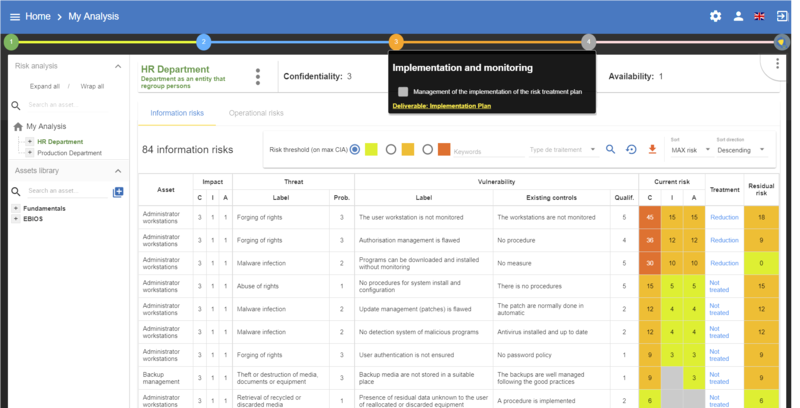 This view goes beyond the ISO/IEC 27005, as it enables the user to manage the follow-up to the implementation of the measures. This is a recommandation established before. You can put a comment for the implementation of the recommendation. For each recommendation you can set a manager. For each recommenddation you can set a deadline. Click on the icon to implement the recommenation and switch on the following view. Set the new control, now in place. It will replace the old one in the risk analysis and also replace the old current risk by the residual risk. Follow the same procedure for each recommendation. After that go to your risk analysis and make a second iteration. The deliverable contains the recommendations to implement table and the implemented recommendations table. A form has to be filled in. When the user clicks on Save, a file in Word format is generated. 1. Confidentiality, Integrity and Availability.